You own a dishwasher, but for some reason, it is not working. You open it up and see a flooded bottom. Even if the brand is a Frigidaire, Samsung, Whirlpool, or even a GE, it is possible to for it to break down eventually. But we don’t want to wash all those dishes by hand, right? I have put together a guide to help you service your broken dishwasher all by yourself. If you are a beginner at fixing things, the steps below will be easy to follow, and will be applicable to almost all of the available dishwasher models. Before following any of the steps below, ensure that your device is turned off and unplugged. Second, scoop out the excess water in order to see the floor of the dishwasher. Most of the parts that need to be cleaned up or repaired are at the bottom, so removing the flood water is important. Drying it out with a rag will also help ensure you can see the parts clearly. You should also use a flashlight in case the light in your kitchen is not sufficient. Getting someone to help you hold the flashlight will also speed up the process of fixing up your broken dishwasher. You might want to check if your dishwasher has a warranty – that way, you can get it fixed for little or no cost at all, and less effort on your part! Also, be warned that some warranties may become void if the dishwasher was opened up or repaired by someone else aside from the maker (brand). Enough chit-chat, let’s get our hands wet and get that dishwasher up and running! Remove the drainage basket. You will need a screwdriver in order to do this. Clean the drainage basket with a sponge and dishwashing soap as needed. Check the drainage area if there are any bits and pieces of leftovers. You will need to remove those to prevent clogging. With a soapy rag, you can clean this area up as needed. Dry it up once done. This is the most common cause of flooded dishwashers. The drain pump is one of the most important parts of the dishwasher, since it houses the motor which forces the water through the hose. If it does not work (i.e. no water pushed out), unfortunately, you can’t repair this, and you will have to replace it. You can contact your local dealer for a replacement drain pump motor in this case. If your dishwasher has a warranty, then this would be one of the best times to use it. At times, leftovers get trapped in the drain valve, and thus inhibit draining. This is a very common occurrence, and happens over time. You can try and clear it by picking out the debris, or by dissolving it with an acid cleaner. 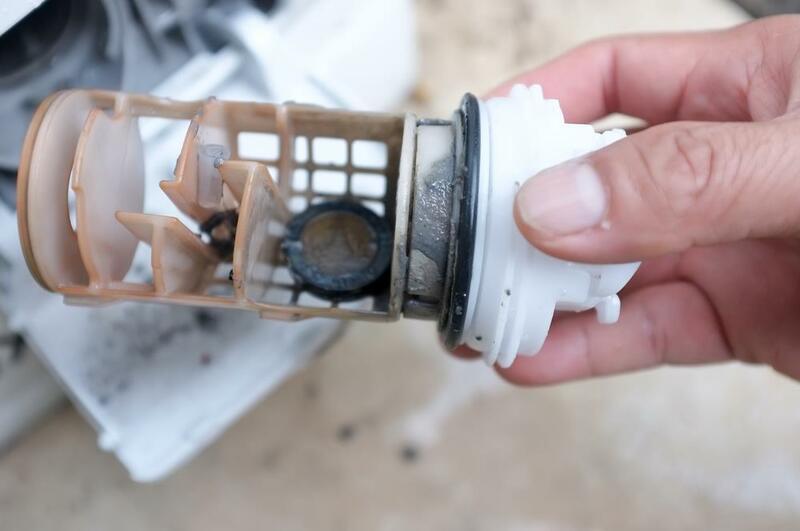 If you made sure that there is nothing else blocking the drain valve and it still does not work, you will need to replace the drain valve, since it is not repairable. Another dishwasher part that may be blocked would be the drain hose. This is where the water passes through to push out the water used when running a cycle. 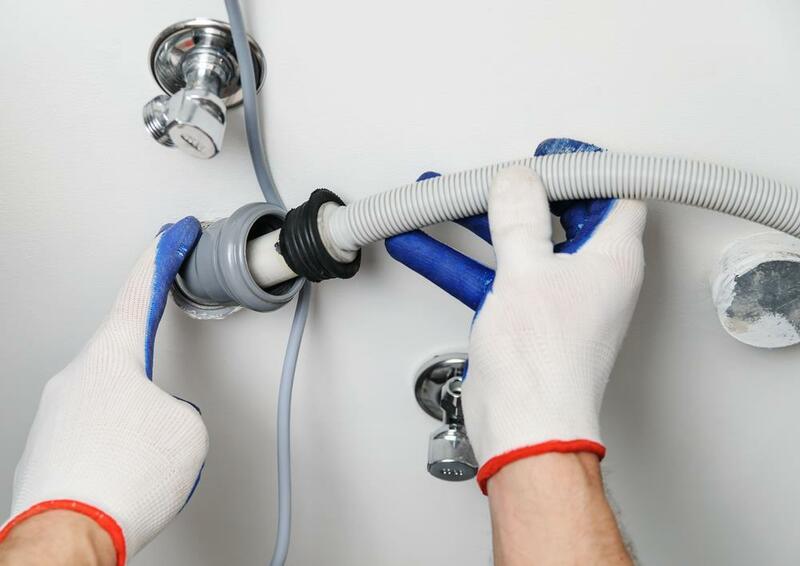 To clean the drain hose out, you will need to dismantle it from both ends – the dishwasher itself and the sink drain. You can pass a rope through the hose to try and dislodge the debris, or you can use a chemical cleaner to flush it out. If you don’t want to use a chemical cleaner, you can always attach it to a faucet, and force the waste out. Take note that this might just push the debris further in, so you will want to use your better judgment on what will work best to unclog the drain hose. Pro Tip: Be very careful when handling the drain hose – the plastic or rubber that makes up the hose might be thin, so use the acid cleaners with care. Make sure that the acid cleaner you are using does not melt nor deform plastic or rubber. Acid cleaners should always be a last resort, and must be used with extra care. The check valve is the part which prevents the used water from going back up to the dishwasher. The check ball is a plastic ball within one of the tube like structures of the check valve. In some cases, the check ball gets stuck, and it should be as easy as freeing it up to get it working again. Depending on what dishwasher you have, it might be too small to see, so you might have to take some time looking for the ball. Make sure it’s the ball you are freeing up, and not another part of the check valve. 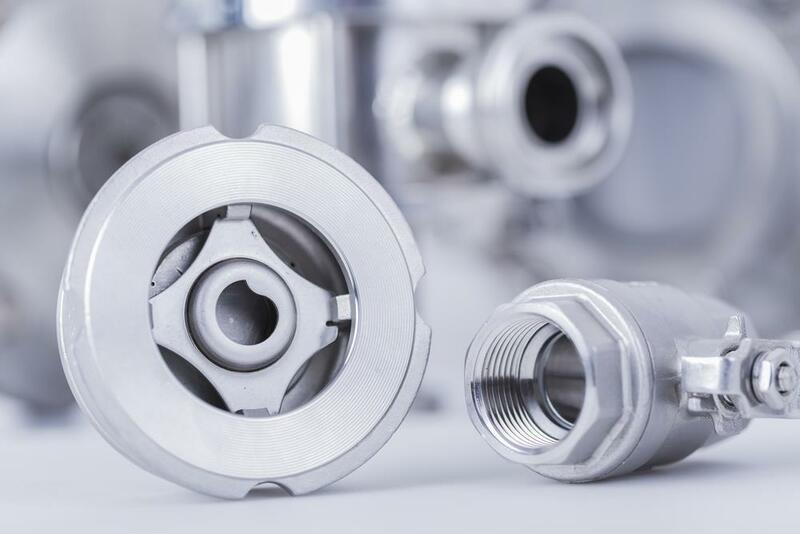 Damaging the check valve might further the dishwasher problem. A good way to free up the check ball is by running some dishwashing liquid on it. It may help loosen it up. Try spinning the ball on its socket, and see if it helps free it up. PRO TIP: It is always better to spin the ball than to try and pry it out. Prying out the ball might cause further damage. 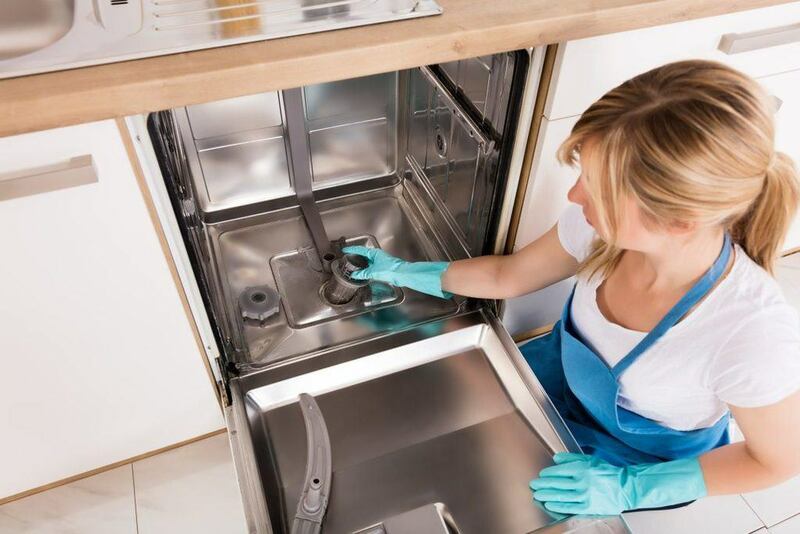 There are two main reasons why the garbage disposer might be stopping the dishwasher from draining: first, it might be clogged; second, it might not be installed properly. The garbage disposer may be an optional installment for your dishwasher – you may or may not have this. If it is clogged, again, you will want to remove all of the debris as much as you can. If the garbage disposer has been recently installed, it is possible that the drain plug may not have been removed. The drain plug is by default, attached, to prevent the water from just gushing out. Removing the drain plug should fix this. The water pump belt is the least common of the problems, since not all dishwashers have it. It would be located near the motor. If the water pump belt is broken or worn out, you will need to purchase a replacement for this, since like most dishwasher parts, is irreparable. PRO TIP: Return all the dismantled parts where you found them. 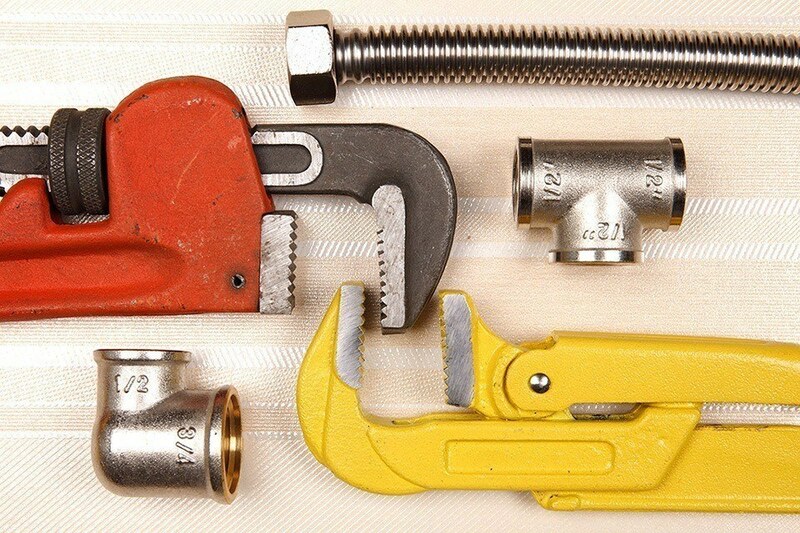 Ensure that all the screws are placed securely, to avoid the parts from moving or vibrating about. Loose parts may cause further damage to your dishwasher. Once you have replaced everything, run a new full cycle on your dishwasher, and see if it now drains. More often than not, stuck debris are the culprits of dishwashers failing to drain. After following the steps above and the dishwasher still fails to drain, it is possible that some of the parts we’ve discussed above may be broken or may have short-circuited. In rare cases of short-circuiting, it would be best to leave the repairs to a professional. Now and then, make sure to clean out your dishwasher. Even if these machines make our life easier, it would still be our responsibility to check the efficiency of these appliances, and maintain it. 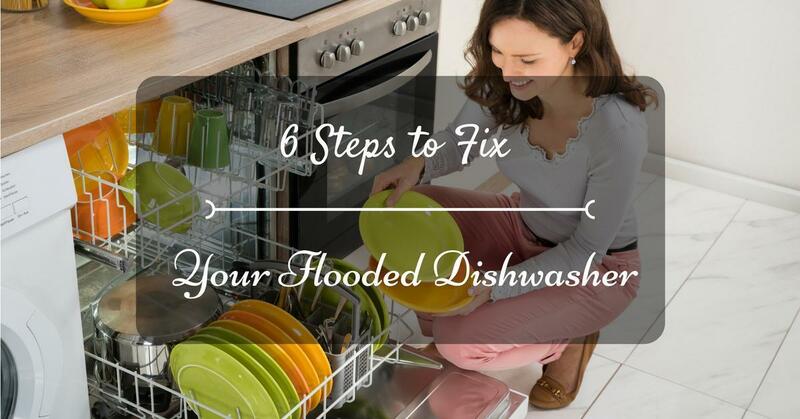 The 6 steps above should address the most common causes of a flooded dishwasher. A single step may help solve the problem immediately. In some cases, you might need to follow all of the steps to get the draining system working. We would love to hear feedback from you - feel free to let us know which step helped you get your dishwasher draining again! You are taking a shower and then you notice that water is barely coming out from the shower head. If ever you experience something like this, I am telling you, there is something wrong with your shower diverter. You may ask, "What should I do? I barely know anything about plumbing!" Well, here is good news. When you notice that something isn't normal in your shower, checking it immediately will be a wise move to do and as a matter of fact, you can fix it yourself! Setting the problem aside may just aggravate the condition of the diverter. The problem that should have been simple may complicate and even get you to spend so much. Chances are, your shower diverter stuck. Why stress when you can have a working shower diverter ? Why do we have to deal with stuck problem? Shower diverter is a valve which controls water flow to a particular outlet. For example, when your bathtub faucet is combined with your shower, a shower converter is attached. When you intend to use the shower, you can have water coming out because it blocks the tub faucet. There are several reasons why shower diverter stuck occurs. Obviously, when you are not getting enough water flowing from your shower head, there could really be a problem. It doesn’t take a genius to realize this. A simple test would be, opening the bathtub faucet to check if there is a normal flow of water. Replacement may come into your mind right away. However, it would be preferable to conduct an inspection to determine if it really needs replacement. Although buying a shower diverter isn’t that expensive and replacement will only take you half an hour the most. There are two main reasons why shower diverter gets stuck. As discussed earlier, the function of the shower diverter is to block water from flowing to the main faucet when you wish to use your shower. So basically what it does is to change its position whenever you use the shower. Any build up in its vicinity will hinder its movement. That is why you will also notice that there will be some water coming out from the main faucet. Your diverter could be the switch type or the pull up-push in type. Regardless of the type, what you can do is to gently tap the converter handle. Giving that “just about enough” jostle could loosen the buildup. 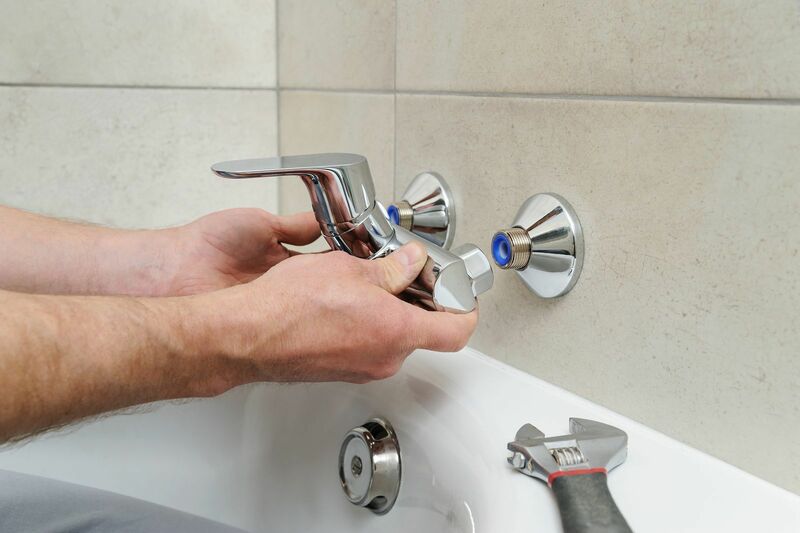 Remember that your tap should be gentle because if you overdo it, you might aggravate the problem you are facing. If nothing happens even with a few gentle tap, then the problem may be more than just a simple buildup. The metal reacts with water and over time the reaction will manifest. This reaction is called corrosion. This usually happens in the bathtub spout. When it does, it affects the functioning of the shower diverter. Another area where corrosion happens is in the screw threads where it connects the pipe into the spout. The corrosion causes buildup. Ignoring it will result for water to seep into the wall. 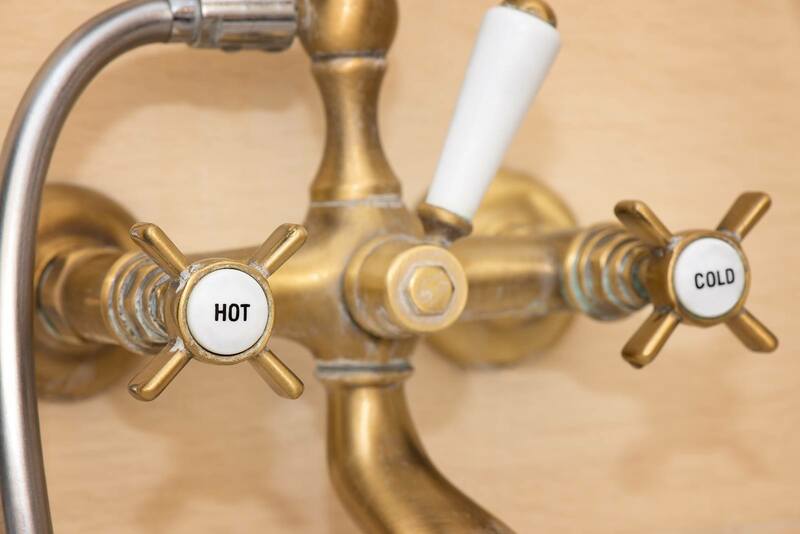 If you are the kind of person who doesn’t mind getting your hands dirty, then you can replace your shower faucet diverter with these easy to follow steps. You can find a screw at the center of the diverter handle. 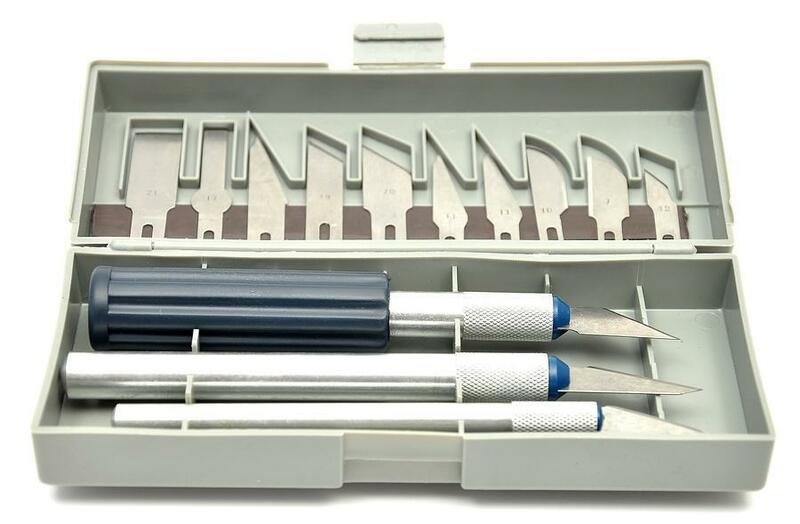 Open this using the flat-head screwdriver. All you need to do is to turn the screw counterclockwise. Once the screw is fully detached, take the diverter handle off. In case, you have difficulty in taking it off because it seems to be stuck, get hold of the entire thing and pull it with controlled force. Twist the handle gradually until it is completely pulled off. If and when it still doesn't work, you can secure a faucet handle puller. This is not difficult to find in any hardware store. You will need to remove these two items by simply spinning them. If the escutcheon is screwed, you will need to take it off. Inspect the handle that you have just taken out. In the handle you will find two things at the back:You will need to make use of the faucet sockets to reach the shoulders a little inside the wall so you could position your wrench. Detach the diverter stem from the shower valve. This should be easy by maneuvering the faucet socket in a counterclockwise direction. There are two assemblies you will encounter here and these are the diverter assembly and the packing nut. Find the larger assembly because that would be the diverter assembly. Here is a video which shows how to replace a shower diverter. Note: Now that the diverter system is taken out, you can replace the old with a new one. For shower diverter repair, continue with steps 5-6 below. If you choose to repair the old one, what you need to do is to replace the washer and screw. Be sure to lube the threads. Plumber holding a bath faucet and installs it. With the help of a flashlight, you can see a circular seat. The hole is where the washer closes against. Make sure it is smooth. In case it is pitted, take it out with a seat wrench. Get the wrench into the whole so you can unscrew it properly and with ease. Replace it with a washer seat. In addition to the above guidelines, you must take note of some important reminders so that any further damage can be avoided. You must turn the main water supply off while you are in the process of fixing your shower diverter. You will avoid potential flooding as well as it allows you to identify which part of the valve is actually leaking. Another reminder would be to seal the drain. You will be dealing with screws and other tiny components, plugging the drain up ensures that all components are intact. Whenever you notice that taking a shower becomes annoying because you are not getting enough water from the shower head, do not ignore the problem. Take time to troubleshoot or have it inspected by a plumber in your area. But with the helpful guide presented to you, doing the troubleshooting by yourself is made easy and practical. Now you certainly have a complete walk through on how to go about a shower diverter stuck. 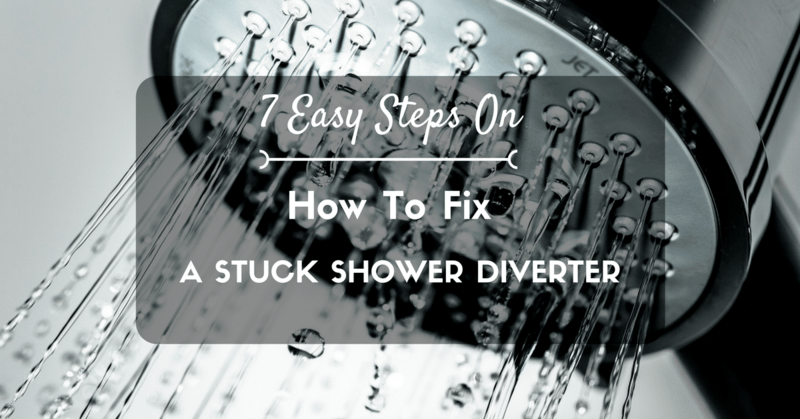 It’s time to get your shower diverter fixed right away while the problem is still manageable. Have you ever painted your walls, and by accident, paint your light switch as well? Plan on changing the color scheme of your miniature soldier collectible? Did your child accidentally splatter paint on your reading glasses? It is a tough job – removing paint from plastic - but sometimes it needs to be done, especially if ruins the aesthetics. A lot of people have this problem, especially miniature figurine hobbyists like me. There are different ways to remove paint from plastic, from using tools to dissolving it with chemicals. Some chemicals might deform softer kinds of plastic. Tools may scratch the surface of the plastic as well. Being a miniature hobbyist, I have tried scraping off paint, to soaking my figures in brake fluid. Below, I have compiled a list of different ways and methods to remove that unwanted paint from plastic. Some of these may prove to be tedious, but surely, all of the methods will get that paint off. There are many different types of plastic, and the methods below are applicable to most, except of course, plastics that are soft as plastic bags. Also, make sure to follow safety measures when doing the methods below. Using any of the tools listed above, you can start scraping off the unwanted / excess paint on the surface of the plastic. Make sure you do this lightly, in order not to scratch the surface of the plastic itself. Try scratching starting from an inconspicuous part where scratches on the surface of the plastic won’t be noticeable. Wipe off the paint residue on the tool you are using and off the surface of the plastic with a slightly damp rag. Wiping the surface of the plastic with the damp rag slightly eases the paint off, and ensures that you are still scraping the paint, and not the plastic surface. You can also use a drop of vegetable oil instead of water to dampen a spot on the rag. Using vegetable oil may loosen up the paint of the plastic. This method is very slow, but it gets the job done. The sharper the tool, the more effective it is. 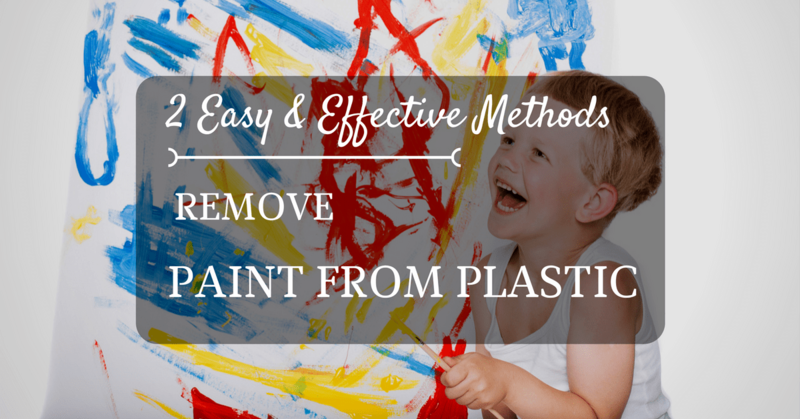 The scraping method works well with poster paints, water-soluble paints, and especially dried oil paint. There are some kinds of plastic that are very sensitive to sharp objects, and scratching it would destroy its aesthetics. For these kinds of plastic, you may want to use a stainless steel spoon, or a hard, disposable plastic spoon instead of a sharp tool like a hobby knife. It is also good to have some lights near your work place to ensure precision when scraping off the paint. Before handling any of the chemicals, make sure that you will be using extra safety measures – put on your gloves, goggles, and face mask to avoid inhaling the fumes and getting unwanted burns. Work in a well-lighted and well-ventilated area. There are many other chemicals to remove paint from plastic, but the chemicals listed above are the ones that are the safest, and the ones that are commonly used. Make sure to note that these chemicals are a fire hazard, so avoid putting them near hot surfaces and electric sockets. Lay out the old newspapers on the floor, to avoid dripping chemicals on it. Make sure you have an extra dry rag in case anything spills or drips. Wet a small portion of the rag in the chemical you have chosen. You do not want to soak the whole rag, only a small part of it. Squeeze out any excess liquid from the rag to avoid removing paint from anything else, or damaging any other properly painted areas. Depending on the chemical you have chosen, it may take several passes of wiping it from the surface of the plastic before you see results. Nail polish remover may not be as effective as DOT3 brake fluid, but it is definitely much safer to use. PRO TIP: If the paint has a direction, for example, a vertical grain, you will want to wipe it with the rag horizontally, and vice versa. Always go against the grain when dissolving paint from plastic. If you don’t see any kind of paint direction, you can do circular movements when wiping it off. This ensures that the chemical remover is distributed evenly and is absorbed properly by the dried paint on the surface of the plastic. When you start to see the paint peeling or coming off, you will want to wipe it off with a dry rag. You want to use as little of these chemicals as much as possible. Keep your workplace dry, and wipe off excess chemicals. If there is still some paint left after wiping the plastic with your dry rag, do some passes again with the chemicals, until all the excess or unwanted paint is gone from the surface of the plastic. Softer plastics might deform with stronger chemicals, so make sure you use the weak chemicals first. If the weaker ones like denatured alcohol and acetone don’t work, then you ought to try using the stronger chemicals. These chemicals work well when it comes to acrylic and latex paints. For tougher paints, you might also want to try a combination of softening the paint with chemicals, and then scraping. DOT3 brake fluid is used mostly by hobbyists to remove acrylic paint off of their miniature figures. In my own experience of using DOT3 brake fluid in removing paint from plastic, it actually works pretty well, given that it is specifically made for automobiles. It does not melt nor deform the plastic figures, but it might if you have softer kinds of plastic. Hard plastics (like eyeglass frames or light switches) do not deform when using DOT3 brake fluid or using any of the other chemicals listed above. 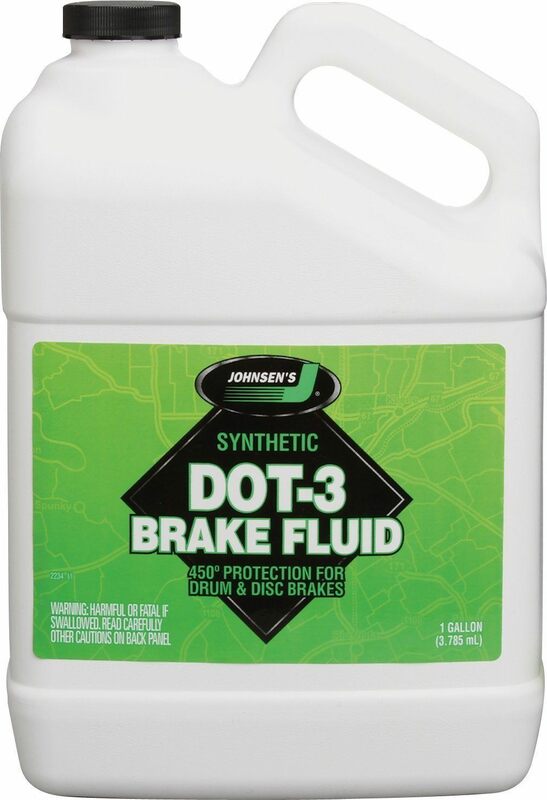 Keep in mind that DOT3 brake fluid is specially made for automobiles so you must take extra precaution when using it. Same goes for the other chemicals listed above – always take extra care when using them. Any of the methods listed above will surely get that unwanted paint off the plastic. You can also do combinations of scraping and dissolving for better and faster results. Always take extra care when doing these methods to avoid accidents like burns, cuts, or suffocation. Keep all fire sources away, if possible, and keep these tools and chemicals where children cannot reach them. If you are still not convinced that you can do it yourself, you can always hire a professional, and they will get the job done for you. The danger of storing gasoline in a household cannot be stressed enough. While we have become overly dependent on gasoline in many aspects in our daily routine, we cannot disregard safety measures when it comes to handling such hazardous chemical. The succeeding discussion will enlighten you on preventive measures when storing gasoline as well as show you how to dispose of gasoline to avoid any untoward incidents. However, before we get into the “how to,” let me share with you some facts on the dangers I am talking about. A project sponsored by the American Society for Testing and Materials conducted by the Worcester Polytechnic Institute on the flammability hazard of gas cans found out conditions that can result in “flashback” explosion. The study further revealed that when gas vapor escapes from the can and a spark or flame is present, this can cause ignition and flashback which then results in an explosion. The study likewise stressed that it doesn’t take a full gas can for an explosion to occur. Gasoline has ignitable, reactive and combustible properties hence considered as hazardous material. Storage of such is highly regulated. But despite the regulation, the danger of storing even a little amount of gasoline is beyond debate. CNBC, in its published news, reported eleven (11) deaths in addition to 1,200 emergency room cases associated with explosions of gasoline cans since 1998. Because the danger is ever present as well as the need for gasoline, we should be knowledgeable on how we can prevent accidents whenever storing and handling gasoline. Taking time to be educated on government standards on gasoline storage will do you good. As a homeowner, it is your responsibility to know restrictions on gasoline storage. You do not only have the responsibility to protect yourself, your family and home but your community as well. All flammable liquids should be contained in no more than 5 gallons capacity can. Should there be a need to store more than 25 gallons, you should have a storage room for that purpose. Therefore it is safe to say that gasoline cans less than 5 gallons capacity satisfy the governmental requirement. 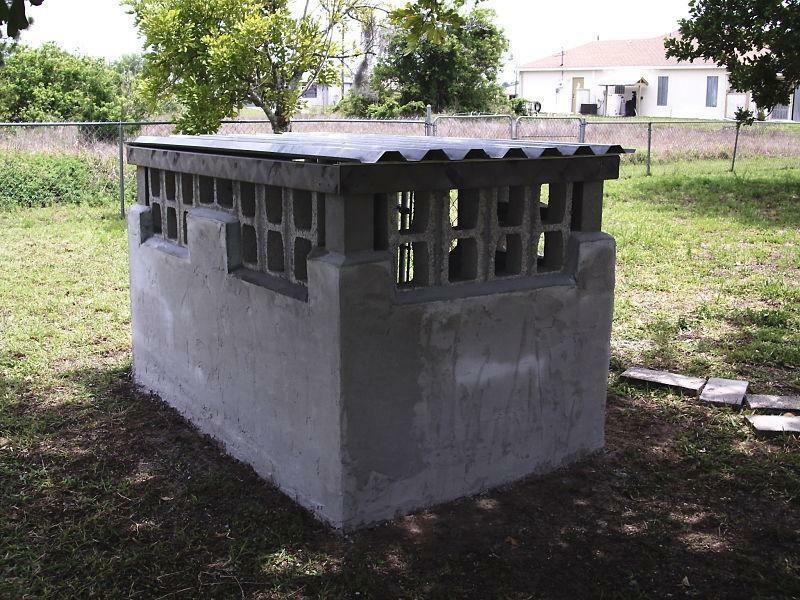 A flash arresting screen is a pre-requisite for a gasoline container to be approved by OSHA. It has an extremely important function in preventing combustion from taking place inside the can whenever there is fire. In simpler explanation, the screen stops fire even before it reaches the gas. Gasoline cans should not be difficult to seal. OSHA requires containers to be equipped with a spring-closing lid. The lid closes by itself upon release and thus it avoids users from forgetting to close it. At the same time, the lid should be secured enough so as not to release so much vapor. Moreover, the can should have a child-resistant cap. Apart from that, approval seals are important. When buying gasoline in cans, be sure to look for the Department of Transportation approval or any recognized testing laboratory. Keep gasoline away from your house. Place it in your shed for instance. OSHA 1926.152(a) (1) specifies requirements for storing flammable liquids. It must be kept in areas where there is not much traffic. Never place it in stairways or areas where people come and go. Makes sure there is good ventilation in your storage area. There is definitely danger when gasoline is exposed to hot temperature. Keep it somewhere where room temperature is preserved, OSHA 1917.156(b) (2) (iv). 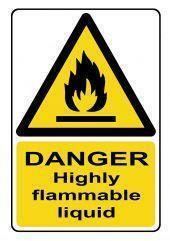 A warning sign is helpful, “Flammable-Keep Away from Open Flames.”Containers must be tightly closed. Extra care must be observed during handling to avoid spills. Ensure distance from anything that can cause ignition. Safe distance would be 50 feet. 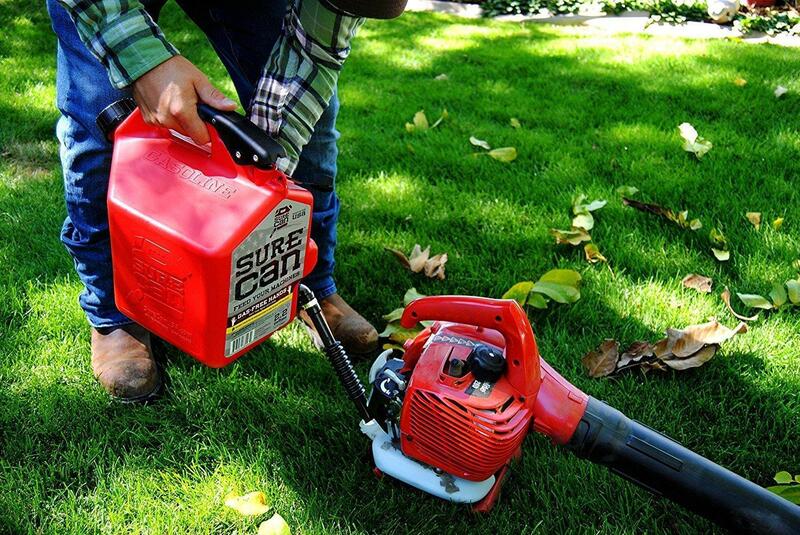 Should you need to put gasoline into machines such as a lawnmower, allow it to cool before doing so. Never allow children to have access to gasoline. In the case of minor spillage, sawdust comes in handy in absorbing the spill. Paper and rags are also options. For larger spills, it is advisable to check with your local government unit to ensure safety. Now that you have an idea on how to handle gasoline especially in your property, it is also equally important to discuss how to dispose of gasoline in case you have bad or excess gas at home. DO NOT dispose of gasoline just about anywhere. Should the idea of throwing gas on a street drain, ground, sewer and the like or maybe putting it together with your garbage, THINK AGAIN! First of all, it will harm the environment. The danger of explosion and contamination is extremely probable. Secondly, doing such can get you into trouble with government authorities. You can be penalized for improper disposal of hazardous material apart from being criminally liable. It is a Federal offense! Below are some of the ways to safely dispose of gasoline. You can bring it to a car shop or even boat yards. These people know how to put old gas to use. Others would mix it up with new gasoline and use it for lawnmowers. Just a reminder, do not use it for your car. If you want to do it yourself, I will show you how. + Set aside old gas. + Make your filter by placing a sheet of paper towel folded to fit into the funnel. + Once your filter is ready, get your glass bottle and put the funnel into the bottle’s opening. + Gradually pour the old gasoline through the funnel. + Change paper towel when necessary. Now that you have filtered the old gas, you are now ready to mix the filtered gas with fresh gas. The ratio is four (4) parts new gasoline and one (1) part gasoline. The result is called reconditioned gasoline. Pay your Fire Department a visit or maybe you can give them a call. They should be able to give you recommendations for best action to take. Check for Household Hazardous Waste Facility in your area which offers free services. Usually, they have landfills where you can bring hazardous waste and you can just drop them there. Of course, you will need to comply with packaging and labeling requirements. There are also service providers you can find in the yellow pages. All you need to do is look for these businesses under Environmental and Ecological Services and Oils, Waste. 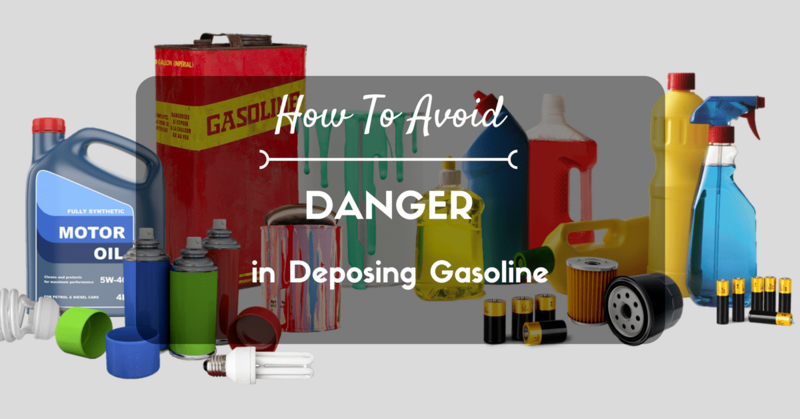 Danger relating to handling, storing and disposing of gasoline can be avoided. Take all precautionary measures to avoid loss of life and property. When it’s gone, you cannot just say, “I told you so.” You must realize the hazard of chemicals such as gasoline presents. It is also good to emphasize that proper disposal of gasoline means recycling the gasoline. In this day and age when depletion of natural resources is also a pressing problem, properly disposing of your old gas lets you contribute to the betterment of our planet. The discussion provided above should be an excellent reference. You might want to go over the discussion one more time. Should you have questions, feel free to comment and I’ll be glad to respond.